turkey, then perhaps some shopping? Happy Thanksgiving to my friends in the US! I’m writing this in advance this year, as I expect to be too full after my turkey meal later today to even think about composing a blog post. As usual, I checked in with my fabulous sponsors earlier this week to get the lowdown on their sales over the weekend and I’m providing all the information here for you should you feel like doing a bit of online shopping! Jones & Vandermeer are offering an additional 20% off items in their “gobble it up” bin with coupon code GOBBLEFILM20. 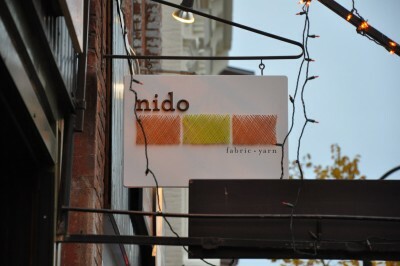 Some fabrics are as low as $6/yard! Includes some Cotton + Steel, Liberty, Carolyn Friedlander, patterns and more! Always free US shipping over $60. Sale ends midnight EST on 11/30. 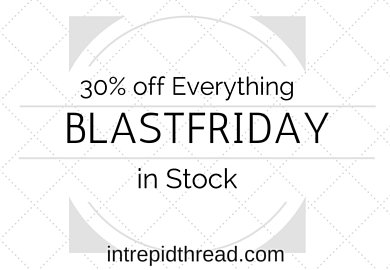 Julie at the Intrepid Thread is offering 30% off with Coupon Code BLASTFRIDAY Includes all in stock items. (Does not include pre-orders). Sale in effect Midnight Eastern Thursday night through Midnight Eastern Saturday night. 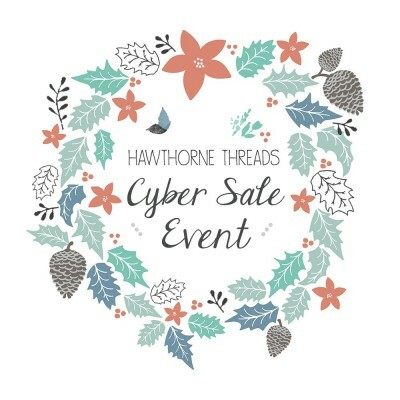 Hawthorne Threads is have a Cyber Sale Event that’s not to be missed! 20% off your first three months of any of our monthly clubs with code CLUB20! Including our new Low Volume club and our popular Liberty of London club. Special pricing on our Janome sewing machines! Some include extra packages as well. Including 48 months 0% financing for purchases over $3000! 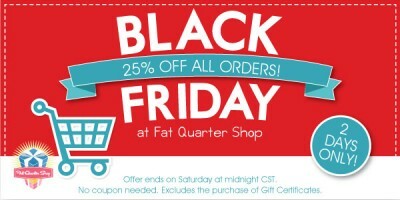 The Fat Quarter Shop is offering 25% OFF all orders from Friday, November 27 until Saturday, November 28 at Midnight CST. Excludes purchases of gift cards. No code necessary. 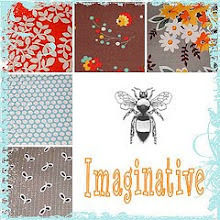 Brooke and Rob at Lady Belle Fabric are offering up to 40% off the entire store! You’ll also receive a 6 piece Sweet As Honey fat quarter bundle with orders over $50 and free US shipping. Sale starts Friday and ends Cyber Monday at midnight, no code needed. 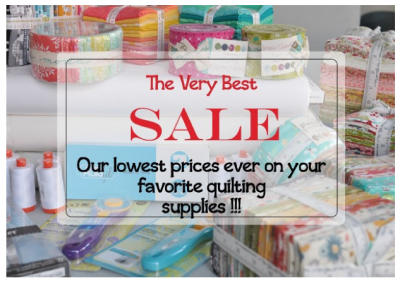 Check out Westwood Acres for a great selection of your favorite quilting supplies, precuts and notions. Sale prices run through November 29th at 11:59 pm. Plus, for the next 24 hours, they are offering a stash builder bundle for just a dollar with any purchase of $75 or more! 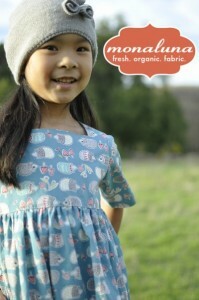 Happy Thanksgiving from Stash Fabrics! We are thankful for our amazing customers!! Save now and save later Thanksgiving – Cyber Monday with us! 20% off your entire purchase with code THANKFUL. Doorbuster specials and free shipping over $50. Plus earn $10 in Stash Cash for every $50 you spend to use on your next purchase with us! Offer expires Nov 30 11:59 EST. 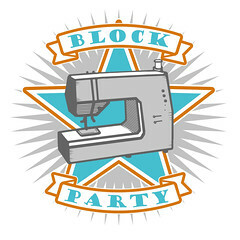 Chio at Llama Fabrics is still working on the details of her sale, though she says it will be a big one! The sale will start on Friday and will run through Sunday. You’ll find deals on precuts by the manufacturer, FQ Bundles and even sporadic sales that will be announced on IG (llamafabrics). Jennifer at Monaluna is offering 15% off from Friday through Sunday using the code HOLIDAYS2015. 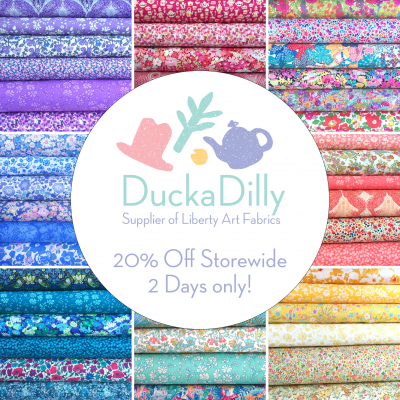 Over at DuckaDilly, you can enjoy 20% off storewide with coupon code “BlackFriday2015” (excludes subscriptions, sale items, and gift certificates). Valid through Saturday midnight EST. Thank you, thank you to all my wonderful sponsors! And yes, I know I mentioned this last year, but I think it’s worth mentioning again, especially if you like to shop online – Ebates, my favorite way to earn a bit of cash back while shopping! I’ve used it for a couple years now, and despite thinking there should be a catch, there really isn’t. You simply set up an account with Ebates, then click through to your favorite online shops through their website. You’ll see the % cashback offered for each online shop and then you’ll be redirected to the store’s website. They automatically send out checks, and I think it’s definitely fun to be surprised by a check in the mail for doing the shopping I was likely going to do anyway. And lastly, in case you’re in need of a finished quilt for a gift this season, I’ve decided to offer 20% off the items in my destash shop (IG – fitfdestash). There are several wonderful quilts in need of a new home, and a few fabrics left from my last destash! If you use IG, simply comment on the photo with your Paypal information to reserve it and I’ll send you an invoice (not on IG? Feel free to comment here instead!). Valid through Monday. 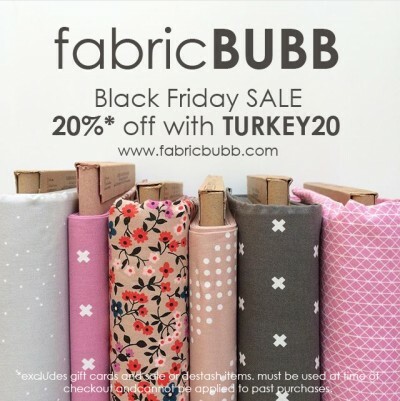 This entry was posted in Fabric and tagged black friday, cyber monday, Fabric, sales, shopping. Bookmark the permalink.